Paying off student loans & affording a mortgage: Possible? When we’re talking about first-time homebuyers and their motivations to buy and general role on the real estate market, one of the biggest topics that usually comes up as the number one setback is student loans. Young and inexperienced homebuyers have several things at play against them, such as lower income levels due to less work experience, smaller savings for the down-payment, and often also a fair amount of student debt. This puts them in a seemingly unfavorable position compared to the seasoned buyers, resulting in fear of not getting approved for a loan under these circumstances. However, an experienced loan officer like you and me knows that having student loans and getting approved for a mortgage are not mutually exclusive. Given that your clients are well-informed and fully aware of the conditions, homeownership is definitely an option. I’ve written a small guide for you to hand out to your clients to help them navigate the mortgage industry without getting haunted by the student loan demon. You’re a few years out of college, got some money saved up from your job, your relationship is evolving great and you’d like to finally move out of your apartment (or worse, your parents’ house), because hell, it’s about time. But you’re knee-deep in your student debt, and you know that debts and a mortgage aren’t really the best of friends. 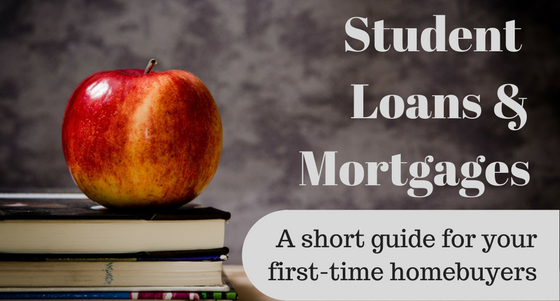 So what effect do student debts really have on whether you can get a mortgage or not? Having student loans doesn’t automatically exclude you from the pool of potential homebuyers. It’s the amount of other debt you have and the way you handle it that does — or could. Your overall debt (including student loans) can’t chew off more than 43% of your income. And with 43% debt-to-income ratio you may find yourself scraping every cent, so a lower value is heavily recommended. That will have influence on the price of the home you want to purchase. That’s the effect of a student debt on purchasing a home in a nutshell — it’s just part of the overall debt:income ratio. There are many factors that determine your mortgage loan eligibility, but let’s discuss the most important ones first: down payment, credit score and debt-to-income ratio. Down Payment matters with most of the conventional and FHA mortgages, because many of them require a certain percentage of the overall cost to be paid up front (usually 3 – 3.5%). Other plans such as VA or USDA rely on 100% financing, so a down payment is not required, but you do need to fulfill extra requirements to get approved. Credit Score can be pretty good level even with student loans on your shoulders. Actually, if you’ve been paying your bills on time, it may have no effect at all. Paying all your bills on time, keeping your total credit usage under 30%, keeping old credit accounts to show your financial history and making use of different types of credit (credit cards, installment etc.) will give your lender a good picture of how able you are to handle your credit. DTI, or debt-to-income ratio is another important factor, which I already explained above. This calculation is usually crucial for the kind of mortgage program you can get approved for, and whether you can get approved at all. With DP, CS and DTI being the front-line players in getting approved for a mortgage, there’re a number of other factors that can serve to your advantage (or disadvantage), so it’s good to keep an eye on them as well. • How much do you actually earn? • How long have you had your job? • What is your employment history? • What’s the current state of the real estate market in your area? • Are mortgage rates decreasing or rising? • When you get approved, are you sure you can really afford it in the long term? Buying your first home is a challenge, there’s no arguing about that. But so many people have managed it before you, why wouldn’t you? Consulting a good credit manager and loan officer are your best bet to get into the market – or at least to start moving in the right direction.